Bath tubs are also very therapeutic for stiff joints, sports injuries, tension and arthritis, to name a few. You can experience hydrotherapy in the comfort of your own home. If you are unable to step into a tub you can get a walk in tub, which will meet the ADA (American Disabilities Act) requirements. You may want a cast iron, acrylic, steel, claw-foot, freestanding or built-in walk-in tub. There are also Japanese soaking tubs and copper tubs. The right one is out there for you. Over the years bathtubs have seen their popularity waver. However if you want to recreate a spa in your own home, a whirlpool bath will do the trick. There are many sizes, with various depths. 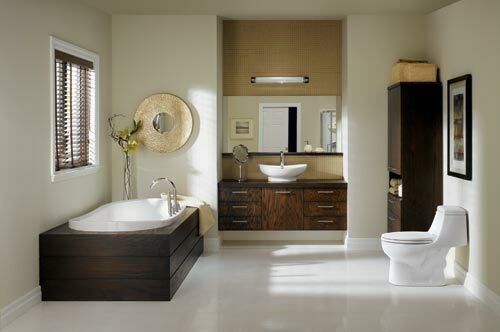 We will accommodate your needs and even custom-make your bath if that is what you want! With many manufacturers offering many styles and colors, the possibilities are endless. Some options for a bathtub include: Airtherapy air jets, that create a sensation of a blanket of bubbles stimulating your circulation. This helps you release toxins and revitalizes your tissues. Hydrotherapy positions the jets in a way that streams of warm water swirl around you, creating a cushion of waves, which relieves pressure on your joints and muscles. Chromatherapy is a light therapy based on the theory that every color has a therapeutic effect on a specific energy center of the body, promoting balance and healing . A hint of red, for example, is great for boosting energy levels. Reduce anxiety and purify your spirit with an immune-boosting purple or a soothing white tone. Simply focus your energy on the chosen color; you'll feel the difference immediately. Aromatherapy fills the air with a gentle scented mist. Just a hint of the right oil can relax, revitalize, refresh and even rejuvenate you. Heat therapy relieves back stiffness and pain and increases flexibility and comfort. Heater for tub maintains the water at the right temperature. It can heal damaged tissue, relieve stiffness and pain and increase flexibility and comfort. By controlling the intensity of your massage you will stimulate your circulatory system and filter out harmful toxins. So go home, light the candles, maybe even pour yourself a glass of wine, dim the lights, play relaxing music and slip into that warm water and relax.